Originally studying languages at university, living abroad, travelling the world and working in the Travel Industry, Howard changed career 13 years ago when he competed in BBC1's Strictly Dance Fever Finals and won Sky's Search for a Presenter in 2005. He is now a professional actor with TV, film & stage credits, also working as a professional presenter and voice artist. His most recent voice over credit was Last Words (visualisation of Simon Armitage Poem) for Channel 4. Description of voice: A natural, conversational vocal style, assured and approachable. Regional accents to hand and languages a strength. 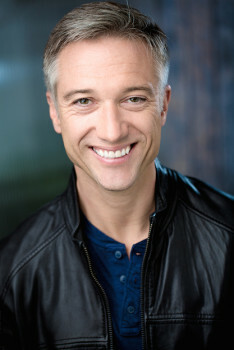 Acting Professional actor with TV, film and stage experience. Credits include: Outlander on Amazon, ITV's Little Boy Blue, Victoria, Emmerdale, Home Fires and BBC's Eastenders, Casualty, Doctors, New Tricks and Sky's The Five. Presenting Over 13 years professional presenting experience including TV, web, video & live events. Performance Professional experience across voice over (commercials, corporate, e-learning, ADR), motion capture, roleplay & forum theatre, improvisation, dance, singing.